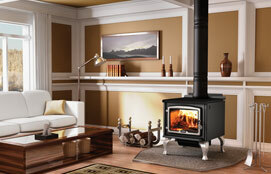 Wood burning stoves remain a popular choice for heat and ambiance. They do fall under the same WETT guidelines as built in wood fireplaces. Classic Fireplace has the WETT certification to make sure it is installed to code so you don’t have to worry about it. The Chalet 1600 and 1800 freestanding wood stoves combine the latest fire technology with a sleek design to offer an impressive wood burning option that fulfills the heating needs of most North American homes. Built to last with efficiency and attractive style in mind, these units will turn your house into the warm and comfortable home of your dreams. There's a reason why a large number of homeowners are stove loyalists – they are timeless in their appeal and provide efficient heating and a unique style. The large selection of stoves from Superior Fireplaces offer distinctive sizes and designs that combine superior craftsmanship and cutting-edge technology.